This script trims or lengthens your current comp duration to the in & out points of its contents, without affecting layer timing relative to one another. If you have layers extending past the beginning or end of your composition, the script will extend the comp to fit them as well. By default, the script will trim to all layers in your comp (including locked layers), though there are options to change functionality. 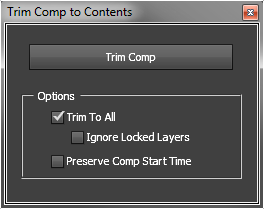 Trim to All - Trim to all layers (if checked) or selected layers (if unchecked). Ignore Locked Layers - Consider locked layers for trimming, or leave them out of the logic. Preserve Comp Start Time - If comp doesn't start at 0, should the script preserve the start point? If you're not interested in using the UI panel version, you can use Trim Comp to Contents with your favourite script launcher (like ft-toolbar or Script Launcher). Simply point the launcher/toolbar to the script file, and will run without showing the UI. Using the following modifier keys, you can alter functionality in a few ways. Originally requested by Alan Fregtman.